Tinguinha Black Belts Added, from Alaska! Last Saturday,September 11th Professor Tinguinha awarded two new TBJJ Black Belts, Justin Charon and Todd Palmer from the Tinguinha BJJ Affiliated school- The Anchorage BJJ School. 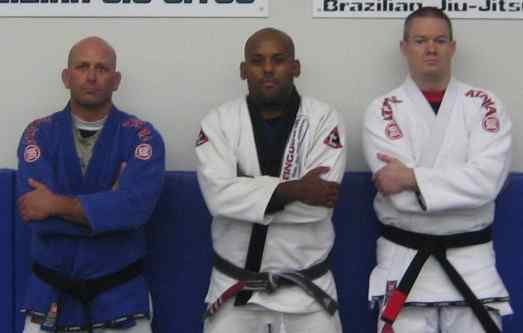 Justin and Todd have been training Brazilian Jiu-Jitsu for more than 15 years, of sweat and dedication on the mat. The Anchorage BJJ School have been doing extremely well. They are doing a great job spreading BJJ in Alaska. The Anchorage BJJ Academy is the biggest BJJ school in Alaska not only in facility size but in student numbers as well and now their head instructors are putting a new federation to help the growth and promotion of the Brazilian Jiu-Jitsu martial art in Alaska. We all from the Tinguinha BJJ Academy wish good them luck on their new venture. Eatting blubber probably helps with the maui thai…!